Pedals on the bicycles can loosen or detach during use, posing a fall hazard to the rider. There are 29 reports of pedals detaching or coming loose during use, including 16 reports of minor injuries. This recall involves about 68,000 two-wheeled youth and adult Huffy, Iron Horse, Mongoose, Northwoods, Pacific, Razor, and Schwinn bicycles measuring 20" or more. They were assembled on-site at Meijer stores by Serv-U-Success of Grandville, Mich. The bicycles were sold between March 2012 and August 2012 and have a Serv-U-Success assembly sticker attached. This recall does not include bicycles with Serv-U-Success assembly stickers written in green marker. The Serv-U-Success assembly sticker is located on the bottom of the bicycle frame between the pedals or on the back of the frame facing the rear tire. A full list of affected models can be found on Meijer's website at http://www4.meijer.com/recall/bikebooklet.pdf. Meijer stores in Michigan, Ohio, Illinois, Indiana and Kentucky from March 2012 through August 2012 for between $60 to $300. 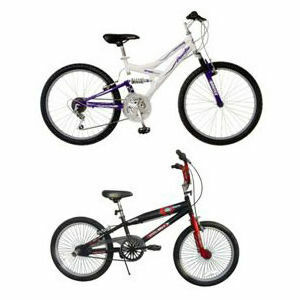 Bicycles sold at Michigan Meijer stores in Cadillac, Gaylord, Petosky and Traverse City are not included in this recall. Immediately stop using the recalled bicycles and return them to any Meijer store for a full refund or a replacement bicycle of the same type and value. Consumers will also receive a $10 store coupon. For additional information, contact Meijer at (800) 927-8699 anytime, or visit the firm's website at www.meijer.com where a link to recalls can be found at the bottom of the homepage. For additional information, contact Meijer at (800) 927-8699 anytime, or visit the firm's website at www.meijer.com where a link to recalls can be found at the bottom of the homepage.